Janice Dilg: So, I am here with Mary Law, former—formerly Mary Ayotte Law, and it's October 23rd, 2014, and we are doing a second interview here in Portland, Oregon, having done one a couple weeks ago together with your, well no, you were never teammates, you and Joy Selig-Petersen, but you were certainly part of that whole dynasty at OSU. So, we haven't done much kind of personal background on you, so perhaps if you would start a little about your family and where you grew up and just kind of some of your early years and interests. Mary Law: Okay. Well, I was born in Inglewood, California, and I'm the fourth of five Ayotte children, and then we moved to the Yakima Valley when I was a year old and lived there, then moved to Richland, Washington when I was, I think, three. I'm not even really sure exactly when we moved to Richland, but we moved to Richland and my mother worked at Hanford Nuclear Area and my dad actually was a machinist, but he had heart disease and was very probably one of the first people to survive open heart surgery, at the University of Washington in Seattle, in 1965. And so he underwent that surgery and survived five years, which was really quite amazing back then, that time period of those surgeries. So, he did pass away in 1970 and my mom remarried then to E. J. Gibson. And then we moved to Gresham when I was in eighth grade, and that is when I started gymnastics, is when I was in eighth grade, and started in a P.E. class at Dexter McCarty Middle School, and I learned a round off back handspring in P.E. class, and I just was, always wanted to do athletics, but I was quite ill as a child, I had very severe asthma, so I wasn't able to do athletics, and I think we touched on a little bit with Joy that really back in those, the sixties and seventies was just beginning, athletics for girls just wasn't as available, at least in where I was growing up. And so I grew up watching my brothers play little league baseball and loved it, but always wanted to be an athlete myself, and because the opportunities weren't there and because of the asthma, I really didn't have that opportunity. So, when we moved to Gresham, I did start gymnastics, and that was really what I just was so passionate about for a very many years. So, I did gymnastics at Gresham High School. My coach was Judy Sandoval and she was wonderful, and a wonderful influence in my life, and then also did club gymnastics at Gresham Gymnastics Club, with Mr. Pat Lloyd, who was a wonderful coach for me as well in those first years. So, that's how I grew up and started. JD: And so when you were, when you were growing up did you like school? Did you or your family have expectations that continuing your education to college was something you should or would do? ML: That's a great question. I always loved school. I went to Christ the King Catholic School in Richland all kinder—well first grade, we didn't have kindergarten there—but loved that, loved school, then middle school and loved Gresham High School. I was student body president at Gresham High School, very involved in the high school. Always loved school. September was always my favorite month. It was my birthday and school was starting. So, just always kind of my biological clock was always school, and so becoming a teacher was just kind of natural. I always knew I wanted to be a teacher. But, my parents, neither one of them graduated from college. And there wasn't really that expectation in my family to go to college. My older siblings, one of them graduated from college, the other two did not. My younger brother did not, he's going back to school right now, though. So, my mother was a very smart woman and she worked like I said, at Hanford, and then did some other secretarial jobs too. She was an outstanding, at that time, secretary, and she was very proud to be a secretary. But she was just really smart with business and she just encouraged me to go on to college, and she's the one that took me all around to all my college visits, and we had a great time doing that, actually doing what they now call recruiting visits, but really we were just visiting colleges and talking with coaches, but so it was really fun to get to do that and visit colleges, and she would have loved to have gone to college and had that kind of education, but she didn't have that opportunity. JD: Sure. It was certainly not as common and it's still not as common for women, in her growing up years, and even still when you were going off to school. It wasn't a given. ML: Yeah, it wasn't a given. And to be a college athlete at that time wasn't a given. So I graduated from high school in 1978 and there really was—it was really kind of just starting where the opportunities for women was starting to catch up. JD: Do you have recollections of your visit to the OSU campus that first time and meeting, it would have been, was the coach Ron Ludwig at that point? ML: Yes, Ron Ludwig was the coach and my mom and I, Oregon State was our last college that we visited and we went in May of my senior year and it was Mom's Weekend, and if you're familiar with Oregon State University and Mom's Weekend, the campus is gorgeous, all the rhododendrons are blooming and it's just a really fun weekend. It was just beautiful. I just remember it being beautiful and just being blown away by how beautiful the campus was and how friendly the people were from the athletic department people, Sylvia Moore—Dr. Sylvia Moore was part of that visit, meeting her and then Ron Ludwig was the coach, meeting him. He was really interested in me coming and that was one of the first coaches that was really interested in me coming and being a part of their team, so that was really encouraging. The people in the academic area were just fantastic. We just walked away thinking this is home, this is where I belong, sort of to speak, but we both felt this was just a really great place. JD: So, then you went back to finish a year in high school, what was the application process like at that point, and when did you find out that you'd be accepted? ML: I don't really remember that. I think I just sent a—I don't remember. Just wrote out an application I guess and mailed it in and then we found—I did get a letter, I do remember getting a letter saying you've been accepted at Oregon State University. And I remember thinking wow, okay, I guess I'm going to go to Oregon State. And I really hadn't heard that much about Oregon State, which is kind of funny, but I hadn't really heard that much about Oregon State but once I went, it was like wow, this is a great place. JD: So then, you arrive on campus, you're going there for two reasons—you clearly want to get an education and you want to strive towards being a teacher, but then you also have this other big commitment of being on the gymnastics team. Talk a little about kind of arriving on campus and balancing those two rather large activities. ML: Yes, it is a real big adjustment for, I think, any freshman that comes to the university. Whether they're a student athlete or not a student athlete, it's a big adjustment. Your time is just organized differently. Of course in high school you're there all day and then in college you go and wow, I only have one class today, you know, so you could just go what am I supposed to do all day? For us, we were—even back then in the early seventies, it was very well-organized as far as when we went to the training room, when we—and I would always went to training room before and after practice, but what I loved about Oregon State too, and I was thinking about this, is my major of education, it was a major, I did get my bachelor of arts in education, it was a fantastic program and I just remember being inspired, even early on, to be a teacher. And what I really liked about my education through Oregon State at that time is we did classroom, oh I don't know how to say, how do I—we did where we went out into the classrooms very early, so we did what we called sophomore block. So, when we were a sophomore in college, our second year we were already going out into the schools and helping teachers and planning lessons and teaching some lessons. Then we had a junior block where we were there longer, and then of course student teaching. So, that's—I really loved that and that just really solidified that yes, I want to be an elementary school teacher, and I loved all of that training that I got. JD: And were there any particular courses or professors that stick in your mind that were memorable for one reason or another? ML: There were several. One was Lee Jenkins, Dr. Lee Jenkins. He was, I don't know if he was the dean, I don't know if that was his title, but he was the head of the education department, and he spent a lot of one on one special time with me. I would go into his office every once in a while and we would just talk about how am I doing, how am I balancing my athletics and my classes. He was just very inspiring. I just got a lot of solid educational philosophy from him. I lost track of him. I don't know where he is now, but he gave me a book and it was a children's literature book called Leo the Late Bloomer, and that was really my story because I was a late bloomer in gymnastics, and I still have that book and he wrote a little note inside it, and it was just really great to have that mentor, you know, all through. He was there all four years. Another person that was really a great character in that, and I took a lot of classes from her, was Martha Ann Norgren. She taught the children's literature classes and I took probably three or four I think, or maybe five, different sections of children's literature. So, I got a minor in children's literature. And it was just really fun to read all kinds of children's books and just have Martha Ann talk about them and all the different authors, and that was really fun. Those are two that kind of stand out. JD: So, as you're talking about going out into classrooms, and I'm assuming in Corvallis, or maybe some of the surrounding towns, what kinds of things were you doing with students, and did you just kind of get assigned to a school and a grade level, or did you get to ask for where you went or what you did? ML: They—I think we were pretty much assigned. I just was so blessed with the teachers that I was paired with. Doris Mimnall was one person that really was influential in me becoming a teacher, and that wasn't even a classroom. That was—I'm trying to remember. I think she went—might have been the librarian or she had a different kind of job and I did—and it wasn't really junior block or student teaching, it was just another class that I took and I ended up being paired with Doris and she was just phenomenal. And then my student teaching was with Caroline Fuquet and she was a wonderful teacher. She influenced me a lot. She was very calm, very organized, very loving, she just had a really great philosophy of structure, and high standards but very loving with the kids too. That was very—she was very influential in my teaching philosophy. So, it was all kinds of different things. We were—like I said, we were given like maybe a reading group. I remember my sophomore block I was given a reading group of little second graders and they would just read with me and I would help them. So, it was really great to just have that experience early on and get to work with the kids and have that input, how to teach. It was really fun. JD: It's definitely a different creature, being there in the room with wiggly second graders and reading about them in a textbook. ML: Yes, yes, very much. And what I liked was they did it so early on and I think they're starting to come back to that again, where you're not just getting a degree and then having student teaching, you know. You need to get out into the schools and get lots of different experiences in the schools and then kind of decide which age level do I really match with well. I loved elementary. That was my thing, loved it. JD: So, I'm assuming you went off and taught after you also had a master's degree, too? ML: Yes, so I was really fortunate to get a post-graduate scholarship from the NCAA. I was awarded that, so I was able to begin my master's degree right after finishing my bachelor's degree, so I kind of started that, substitute-taught for a year, and then I did get a long-term sub kindergarten job at Harding School that—towards the end of that year. Loved that. I loved kindergarten, it's really fun. Then I was able to get a teaching job in the Lebanon school district and my principal Phil Atkinson, another mentor that really poured a lot into me, and I just loved being under his leadership, he was a fantastic leader—so I taught at Cascades Elementary School in Lebanon for seven years. Third grade and second grade. I started in second grade and then third grade, and I really loved that. That was really a fun, fun time of my life, just being a classroom teacher. Second grade and third grade had, we had a great staff at Cascades at that time, it was really, really great experience. I loved that. And then when I got pregnant with my son David, Randy and I decided that I really wanted to be home with our kids when they were little, especially before school, and so we were able to do that. Randy was teaching, had gone back and got his teaching degree at that time, so I was able to do that. So then I was home with David, so I didn't teach in the classroom anymore, but was really fortunate to have that post-graduate scholarship, finish that up and then finish my masters while I was teaching. I think I finished in '85, went to night school and did two things at once, but glad I got to have that experience too. JD: Well, and I think your mention of having a scholarship brings up the issue of the cost of college and how you paid for college. I mean, it definitely wasn't inexpensive. It may not have been quite the debt-inducing endeavor that people talk about today, but how did you go about handling the financial side of it? ML: Well, I was very fortunate. Again, so I started out on a partial scholarship and then—my freshman year--, but then because my father had passed away, we had some social security insurance money that we were given each month. So, between that and my scholarship, pretty much covered. I did work in the summer to—and worked in high school and saved up for that, so that was barely covered, and then beginning of my sophomore year I was put on a full scholarship, so that was really a blessing to be—have that paid for. Then my master's degree, the NCAA post-graduate scholarship started out helping pay for that, and then I was able to apply for and was given a graduate teaching assistantship. So, I helped out with a really neat set of classes in the summer one summer, where we had different educational professionals come into Oregon State and did like weeklong workshops. And teachers from around the area, from around the state came and took those classes. They were like graduate classes, and so I helped with that. So that—and then was able to get credits taking those classes. So that ended up being great—Lee Jenkins set that up for me, I'm sure. So, that was another great way to help pay for that and get that great experience with all those great professionals, so that was really neat. ML: Well, in high school I worked at McDonalds, that was my first job and that was actually, I really enjoyed that. I liked customer service. I worked with my mom in her office when she worked at Schmidt's Garden Center. There's a nursery, a tree nursery in Gresham and so I would help her in the office. I did some office work for her, and when I was in college I didn't work in the summer. So, my first summer I went home and was home for the summer and then the next two summers I stayed in Corvallis, went to school and trained. So, I didn't work. I was working doing gymnastics. JD: And did you live in the dorms, did you live off campus, was there—were there certain rules for student athletes at that time? ML: At that time there weren't any rules. I don't think—well maybe we did have to live in the dorms the first year. I don't remember it being a rule, but I did live in Poling Hall and that was my first year, and then my second year I lived in an apartment with some girlfriends and then my third year I lived in a house with some girlfriends, and my fourth year I was married, so I—Randy and I lived in a little dinky little apartment. It was great though, it was right off campus, and so that's where we lived. JD: So, how did the two of you meet? ML: We meet at an Athletes in Ministry meeting. My teammate, Kris Femling, was speaking at it, and so I went with Kris. She said "won't you come with me because I have to speak at this thing and I don't know what I'm saying and everything." So, I went with her and I met Randy there. He was playing the piano and our friend Bruce Alexander was leading the singing. He was a track athlete. And Randy played the piano, Bruce was singing, and that's where I met him. He came up and introduced himself. JD: And, so was it uncommon for students to get married while you were at school, and was there pushback from any official quarters about that? ML: It was unusual. I don't think there were very many that were married. My mom wasn't real great—real excited about it. She wanted me to finish school. She did not want me to go all that effort and not graduate. So, I had to promise "I will graduate if I get married. I will graduate," which I did. So, it was unusual. I don't there were any other athletes that were married, but we just decided that was the best for us and it worked out great. JD: And so there wasn't any concern with the—with your coach or in the gymnastics program that you were going to get too sidetracked or anything like that? ML: No, they were supportive. They were really supportive. Randy was really supportive of me too, I mean he, back then—of course we had typewriters. We have to explain this to our kids. We had typewriters and so I would write the papers, he would not write them for me, but he would type them. He typed a lot of my papers. And that was really helpful. Spent hours, of course, doing that, because there weren't computers. Yet, it was fairly soon after we were out of college that computers came, but—personal computers—and he cooked dinners for us and so that was great. He was very supportive that way. JD: Wow. Yeah, I am old enough that I remember doing some of my early college papers and the thing that was really hard with typewriters was footnotes. JD: You know, you had to manually set all that up and it did, it took effort. ML: It took effort, and then if you made a mistake, of course you had to put the little paper thing in there and you couldn't just edit as you were going. Now we just write—at least I do when I write—I just write. That's how we teach kids how to write, right? Just write, just get your thoughts down, edit later. Well now it's just so easy because you just move things around and, but then you had to write it by hand and type it. Very time-consuming. JD: So, I know you're clearly very busy, did you have time to just kind of hang out and have a social life and have any haunts that you liked to hang out at with your teammates or your friends, or with Randy? ML: Well, really didn't have very much free time. The two college memories I have that are really fond memories is one when it was nice spring term—of course always got, I had always got good grades but I got a little less stellar grades spring term, because it was sunny and I would sit out in the quad and eat Tootsie Rolls, that was kind of what I was known for, because I was—go to the bookstore and they had penny Tootsie Rolls. Mine were those little Tootsie Rolls for pennies. I would count out the Tootsie Rolls in the bag and then go pay for my Tootsie Rolls and eat them in the quad while I was studying. Loved that, and then a big group of friends, we would play Frisbee golf, and we had a Frisbee golf course in campus. It went all over campus, eighteen holes. JD: Did you create this course yourselves? ML: Yes, we created the course. And now some of the trees are gone, which is a bummer, but campus has changed a lot. ML: But we had a lot of fun with that. We did that a lot actually, we played Frisbee golf, and if we didn't have very much time we'd just do the front nine. And if we wanted, sometimes we'd do the back nine. JD: So, can you just like broadly talk about what—where the course was on campus to orient someone who's watching this? ML: Okay, so it started on Monroe. It's where the—it used to be an ice cream shop and now it's, oh, what's the name of it? It's like Bad Habits Smoke Shop and Ozone? What's it called? ML: Anyway, there's a little coffee shop on the end, on the corner. So that's where it started, because my husband and his friends lived in this little apartment upstairs. It used to be Strahms [?] Office Supply, and upstairs they had this apartment, so we would start down below the apartment and then we would go across the street. And then the last hole was we had to throw it and try to get the Frisbee up into the balcony of the apartment. That was the last hole. If we got it up there it was really good. We never broke any windows or anything, but we would just go through buildings and, I'm trying to think of...the trees were, quite a few trees were like the target. It was just, through the —we didn't go through, we didn't go inside buildings but we just went through and around. ML: It was very fun. ML: We had a great time. JD: You did have good grades. ML: I did have good grades, and blue key was one of those things that Dr. Sylvia Moore was part of and she is the one that really wanted me to apply for that, and I actually, I did not even know what Blue Key was, and so she said "you need to apply for this," and I was like "okay." And so she had me apply for Blue Key and then when they came to pin me they did it this sneaky thing where they had me go into Dr. Moore's office, and she was one of the athletic directors then, and I went into her office and she was like mad. I was like "what did I do," and I'm racking my brain. I broke a rule somehow, I am in big trouble with Dr. Moore, I am in big trouble. So I go in there and I sit down and they do this whole big thing of how I'm in trouble and then they said "no really you're in—no really this is we're tabbing you for a Blue Key" and I was so confused. I was like "what are you talking about?" And so then I finally figured it out. So, then I was involved with Blue Key and that was a part of my Oregon State time that I kind of forgot about, but it was really, that was a great organization. And I was one of the officers eventually and we did service things around campus and around the community and we had some excellent mentors there, too. They were wonderful to get to work with and be with in Blue Key, that was fun. JD: And so what kind of service projects would you do? ML: Oh, I don't...I don't remember. JD: I know, I'm really making you rack your brain here. ML: I don't remember what we did. That's really bad. ML: I don't remember projects but I remember the meetings. I don't remember projects. JD: So, you've mentioned Dr. Sylvia Moore a couple of times, maybe just tell a little about who she was and what your interactions, how you knew her and what the two of you did together. ML: Well, she was the first gymnastics coach at Oregon State, so she started the program, I think with Astrid Hancock also, was a part of that, also was a professor there at Oregon State. And I just saw her the other day on campus. 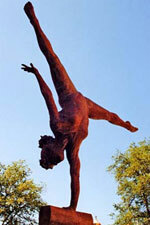 But Dr. Moore was the first gymnastics coach and she was really a great warrior, so to speak, for women's athletic. She did so much for women's athletics nationally and was on the national gymnastics committee for years and did so much work behind the scenes to help implement Title IX and those kinds of things for women. But at Oregon State she was the first women's gymnastics coach and then Ron Ludwig succeeded her and then she was one of the athletic directors for a long time and worked in the athletic department. In various roles, but was one of the athletic departments—now I think it's senior women's administrator, is perhaps the title, I think that they're still using it, I don't know if they still use that, but so Dr. Moore was instrumental in making sure that women started to become, be able to have these opportunities to do athletics in college. So, she also was the announcer when I was competing, so she would always announce our names when we were going up to do our events. And she, so she was great. She did all kinds of things for Oregon State. JD: And so, you're on the team, talk a little about, like what the size of the team was and just kind of how it functioned when you first started in 1979, correct? ML: Right, right. So, my freshman year was fall of '78, '79. I think we had a full team. There were only a couple of girls on scholarship though, Kris Femling being one of them, Jill Hicks was one of the other scholarship athletes. There were—and Linda Parker was another one that was on scholarship. We didn't have all full scholarships. There were probably some other athletes that had scholarships I'm not aware of or don't remember, but most of us were either partial or walked on, but we had a full team and at that time we had to have at least two athletes that competed in the all-around. So, they had to do all four events. So, I was one of the all-arounders and Kris was the other one at that time. I think Linda couldn't do all-around anymore because she was recovering from knee injuries, but now they don't have to have all-arounders. They can have, they have some, I mean all-around is still an event that you can win, but then we had to have all-arounders. So, there were some people, most of us trained all four events but some just did a couple of events. It was more unusual to be a specialist than to be an all-around. Most of us trained all four events, and then they would pick whichever top six. It was still six back then. Top six on each event that would be on, competed for that event. JD: So, were you practicing every day, more than once a day? All the days of the week, or? ML: We practiced, I think we practiced five days a week and then we would do some weight training, a little bit, but we practiced in the afternoons, so we had class in the morning and we would practice in the afternoons, and I remember being done like right around six-thirty, six-forty-five, so we would have to run over to the dorms. They closed at seven. And we were the women's building that first year, so we'd have to run over. So we'd probably practice like from two or two-thirty to seven. It was a little bit longer, I think, than what we do now. That's about what they do now, but a little shorter. JD: And you mentioned weight training. I guess as I was thinking about this interview, you know, just wondering how training, diet, kind of all of that, nutrition, had changed and what it was like when you were there. ML: I think they educate the athletes a lot better now on nutrition. Joy and I were talking a little bit about we just didn't eat. I really didn't eat very much. I just remember eating cottage cheese and crackers and popcorn. That was kind of what we ate, was popcorn. And I ate better when I met Randy and he started cooking, you know. I ate a lot better my senior year. But, I think they just do a lot better job now educating. They just actually hired a fulltime nutritionist for the athletic department, Stacy is her name, and so I'm excited that they have a fulltime person in place to help the athletes really understand what is going to be their optimal fitness level. It's not just about how much you weigh. It's really your fitness level and that's kind of more the approach they take now, which is, I think, super. And it's much, much healthier. JD: So, you're all practicing and you're competing, did you have favorite events, favorite moves, did that change over time as you got more skilled? Because you were kind of still learning and developing when you were at OSU. ML: Yes, very much so. I—my gymnastics changed dramatically from the time I was a freshman till I was a senior. I always really liked training balance beam. That was my favorite event to train. I just really loved the feeling of really being in balance and control and centered. When you're hitting your beam routine, when you're having a good day on beam, it's just a great feeling, it's just really, you just feel like you're in total control of your body and everything that you're doing in your mind and your focus. So, I always loved training balance beam, but it was most nerve-wracking event to compete. I loved it when I hit it but it was just really nerve-wracking to compete beam, just no room for error. My favorite event to compete was floor exercise. So, I really loved performing and really felt like it was more a performance and didn't get nearly as nervous for floor. Vault was pretty easy, I was a powerful gymnast, so that was one of my better events. Bars was my most difficult event, because it's—it's the—you have to learn how to swing on bars and when you're really strong and tight like I was, it took me a long time to figure that out, figure out how do you relax and be strong at the same time. How do you let yourself swing and still be in control? That was something that was really hard for me to learn, and I really felt like my senior year in college I just really figured out bars and was really starting to get good on bars and then it was over. So that was kind of a bummer, but bars is really fun to train also, because that feeling of swinging and flying is really fun. JD: Certainly looks magical to watch. ML: Yeah, bars is really exciting now too, because it's much different. The bars have changed the most from when I was doing gymnastics and the bars, the actual bars themselves have really changed. They used to be very close. We used to do what was called a beat, so we would be on the high bar and we would beat our hips against the low bar. I hated it. I hated that. I was so glad when I could not do that anymore. Bars changed. But so the bars had to be close enough to where it would fit you so that you would beat the bar and then if you would come around this way on the bar, from the high bar to the low bar, you would wrap the bar, so you would let go of the bar and you would wrap around and then catch the high bar. So, the bars were much closer, so it was very different. Now the bars are really wide, like if I stood on the low bar I'd be like chicken to jump to the high bar. I mean they're so far, and so the skills they can do now are really, really different. It's much more like men's high bar where they're giant-swinging, pirouetting and then doing release moves where they let go of the bar, flip and then catch it again. And then it's just a constant swinging and hand-standing, so we were barely starting to go to handstand on bars when I was in high school and college. People didn't really cast a handstand. So that was just kind of starting to come into high school and college gymnastics where we'd handstand. A gymnast from the University of Utah named Diane Ellingston was actually the first college gymnast to do a giant swing and then I think I was the second gymnast to compete a giant swing on the bars in college. So, those kind of—that skill, which is so common now, I mean our little one is learning giant swings, was really unique. Because the bars were so close, they weren't wide enough for us to swing. JD: Oh that's, I, that's a really interesting point. And so, you were—you mentioned that you know, there needed to be at least so many all-arounds and some people specialize but, you know, so basically you're all kind of learning the same skills, the same events, you may have different routines, particularly, I would guess, like floor routines or floor exercise, am I getting the name right? ML: Yeah, floor exercises, that's right. So, in college gymnastics every athlete has their own routine, so in USA gymnastics when they're younger in the lower levels, they have what's called compulsories, compulsory routines, so they all do the same routine at each level. Then once you get to a certain level it's called optional gymnastics and everyone does their own routine. So, college gymnastics is optionals, so every gymnast choreographs their own routine. On vault is not. They choose which vault they do, but bars, beam and floor every athlete has their own routine. So, the great thing is you just take your strengths and you hide your weaknesses. You take your strengths and you put those things in your routine. So, Laurie Carter on our team, for instance, was super flexible, so she did all this amazing stuff on balance beam because she was super flexible. I could not even like grab my foot and Laurie would put it up behind her head in a full split. So, you know, things that Laurie could do I couldn't do and things that I could do Laurie couldn't do, so our routines were very, very different. So, that's kind of one of the neat things about college gymnastics, is that every athlete's routine is custom made for her. JD: But you're still both team members as well as individual competitors. ML: Right, right. Which is really fun in college gymnastics, because you are individual, there are individual event winners in each meet and then in each championship meet, but you're a team. So, college gymnastics really, and through the years it's become more and more team-oriented. At the national championship level they have the first day where it's the prelims, and that's when the all-around champion is decided, on that first day, and then the top six teams go on to the super six, so that's the team championship the second day. So, that team championship's really important. And then the third day they do the individual event finals. So, you can be a national champion on the individual events still and then team also, so it is both. You're competing against—on that last day you're competing against maybe even your own teammate for that individual event title. But in the team day you definitely want your teammate to do her best. Maybe even beat you. Because you want the highest score for the day. JD: Because you want the points. JD: And does that, those days of individual competition, does that, are those hard sometimes? ML: Those were actually really fun. That—those— the finals at the national championships were some of my fondest memories. Just getting to be with other gymnasts from all over the country, all over different teams, and really there was just kind of a unique comradery there, knowing that you're the best of the best and you're on that event and there's eight of you or ten or however many made the finals and you're just—my, my philosophy was always "I want everyone to do their best routine, and may the best person win." You know, it's you want to be the best that day. You know everyone's really good, so you just want everyone to hit and then to be the best that day. And that's, now it's just the margin of error is so much, it's just so small. Like you can get a 9.9 and not win. It's just the level of gymnastics now is so phenomenal it's really fun to watch. ML: Yeah, it's a tiny margin in there. Yeah, yeah there really is. I mean one little wobble on the balance beam, that's the difference. JD: And how is it as a team, or you individually, how do you all kind of deal with like those ups and downs as you go through all your different routines in a high stress competition, or even just a regular, you know, one on one school competition? How do you handle that? ML: Right, there's those two factors. So, there's the make the lineup competition within the team, and that's, that is a very tricky thing for coaches to navigate, because you want your athletes, and even, you know, back in my day it was true. Only so many—there's only six spots. So, you might have ten athletes that are beautiful beam workers and there's only six that make the lineup, and it can change throughout the season. You can change them the date of the meet. You can change them right before the event. So, you can make adjustments, but you've got to have this kind of team mindset where you want that competition within the team so everyone elevates their performance to be the best they can be. So, you'll want that kind of competition within your team, and yet at the same time that team, real team true spirit, where you're actually not going to undermine your teammate to get that spot. You're going to beat your teammate to get that spot. So, that kind of coaching is really, really important I think. And then at the meet itself, each of those gymnasts have to be that individual. You're competing for your team but you're being that individual, because you have to block out, okay if this person fell that's going before me, I can't let that affect my performance, because I've got to do my job. So, that's another dynamic that's individual team in the sport, that's unique. JD: And is there much difference between like a two-team meet and then when it's the NCAAs, or I know you went off to some international meets, that we touched on just briefly before. How does the atmosphere change or how do you work as a team or an individual change? ML: It's really different each meet. So, like home meets for Oregon State, we have a great crowd. We have just maintained this wonderful following of fans that's just been so great through the years. From when I started and through today. We have four to five thousand fans at every home meet. It's just amazing. They're awesome. So, we format our meet, so I've been the floor manager for Oregon State for a lot of years, so when we have our meets, our fans, we know they want to see every performance. They want to see the visiting team and they want to see our team, so we alternate. So we'll have like the one team, Oregon State will start on vault, they'll vault and then the other team will do bars and then they'll alternate, so it's one event going at a time. If we have a dual meet, if we have three or four teams, we can't really do that. We take forever. We try to keep our meets at two hours, so we do all four events at a time. So that's a little bit like a three-ring circus where you're trying to watch, "oh wow, wow," you know, especially when there's such great gymnastics on every team. So it does, the format of the meets change wherever you go. When you go to the University of Utah, for instance, they have ten, twelve thousand fans. They fill their arena every meet, they have an amazing crowd. It's so loud and so different, you know. You go to another arena and there's two hundred people there. You know, and this is huge, like at Gill Coliseum, you know, two hundred people in there. So, it just really depends on what arena you're going to. Championships like the PAC-12 championship meet, the regional championship meet, national championships, it's all four events at a time and some of those are six teams, so it's you have a couple byes in there. So, where you might do an event and then you have a bye and then you go back, and so it's formatted a little bit differently each meet, but, so you have to train that. I mean the coaching staff has to train their athletes to be able to be ready mentally to hit that routine all kinds of different formats. If someone gets hurt, you've got to be able to hit your routine cold. So, you may not have been in warmups, because they only have so many people that can warm up. So, if someone gets hurt and you didn't get to warm up, you go and you hit it cold. So, they have to do all that kind of training to be able to be ready for any kind of situation. JD: And I think we touched a little on the World University Games that you went to that were in Romania, which was in 1981? Do I have that year right? JD: So, you know, so it's still the Cold War, the Berlin Wall hasn't fallen yet, the Soviet Union's still the Soviet Union, what was that experience like, both traveling to a very different country and culture, as well as just the event itself? ML: That was a really life-changing experience for me, in both ways. So, the gymnastics part was amazing because it was the world university games, and it was all Olympic sports. So, the United States sent a huge contingent. There were three or four hundred athletes in our team, and it was just amazing to get to meet athletes from all different sports, all over the country, you know, really Olympic level athletes that were coming and doing this meet, or this competition. It was really quite, quite amazing. So, they had an opening ceremony and yes, it was communist Romania at that time. It was closed. And so for this event to come to the people, they were so warm and welcoming and they were just really, it was amazing to have outside people from the world in their country, because it was closed. Just, I have so many memories of that, but I just remember we were going to opening ceremonies, it was in a big outdoor stadium, and we're just driving through the streets of Bucharest and kids were on the street waiving, and so we were hanging out of the window waving at them, you know, it was the USA, and so they were just "oh, US," and they are just, you know, thought it was great. And that was really exciting. And then we did opening ceremonies, walked around, and that was really, really memorable. It was also heartbreaking because it was this huge event and of course there were huge food needs, all these athletes, thousands of athletes from all over the world, and we would go on buses and they had guards with machine guns everywhere we went and on the buses and all of the streets, all the venues, guards with machine guns. And we would get on the buses and we would go through town and we would see these lines out of these stores, and our interpreter was this sweet girl and she would—went everywhere with us, with our team. Every team had their interpreter, and we would say "what are all those lines?" and she'd say "well," she'd look around, you know, because she didn't want to get in trouble, "those are food lines, because there's food shortage in the city because all of the food is going to the games." That made me feel really bad, you know, because we were having all this food and then we knew that they were a poor country, really, and then we felt bad. You know, it was like wow, it really made you realize the freedoms that we have. JD: Yeah, those are just important connections to make that I think a lot of, you know, college is often about opening one's mind and having new experiences, and that was a very tangible one and it came in kind of a different way. ML: Yes, it did. It was very eye-opening and it was, still have a very soft spot in my heart for Romania. It's a beautiful country. I would love to go back. JD: And I'm guessing that it was quite an ordeal traveling at that point. It was certainly, you know, there was a lot of airplanes and all that, but you know, it was still a very different time period. ML: It was a very different time period. We all met in New York and then we, and then we must have had a charter plane, all over there. An interesting thing that kind of happened to me that was indicative of it was a different time period is we got to New York and one of my coach—the coach said "okay, so everyone give me your floor music," and we were supposed to bring our floor music on a cassette tape, because that's what we had back then. She's going "okay, everyone give me your floor music, because I don't want those to get lost," and I just panicked. I had forgotten my floor music. And I was, oh I have a stomachache to this day. I had forgotten my floor music. And so I called my coach and he said "I can't believe you forgot your floor music!" "I don't know what happened, I just forgot it!" And so we were scrambling around like "well, what are we going to do? We can't—" there's no computers, I mean you can't just send it, email it. Now you would just email it, right? JD: Right. No overnight express. ML: Yeah, no overnight, no overnight. And so what happened was—this was amazing—so then I thought "okay, well I'm not going to get to compete." So we had an alternate. Julie Goughey was the alternate, and she's probably thinking "I get to compete," you know, and I was just crestfallen. I was going to—not going to get to compete. So what was my coach mailed it, and it must have been like a two-day air or something, I don't know how he got it, but he sent it. One of the judges that was supposed to come with us had a heart attack, and so was not able to come, so they had to have a substitute judge from Texas come, like two days later. So Ron mailed my music to this judge and then the judge took it to Romania. So like two days later, after it was like the day before the meet, he walks into my dorm room and hands me this packages with my floor music, and so I did get to compete. JD: Just to keep it interesting. ML: Oh, it was amazing. But I felt bad for Julie because she can't compete, but I did. JD: Sure. Well, and the team went on another trip to Japan, which is a whole different culture and experience, and I think that was kind of some of the first travelling perhaps that the OSU women's gymnastics team did? JD: Talk a little about that experience. ML: Yes, that was actually a great trip. Ron had connections with a coach that was in Eugene but he was, I think, on the Japanese national team, and so he had still connections in Japan. So, the plan was that we were going to go to Japan and we were going to do these meets, two meets with either the Japanese national team or some other of the university over there, and we're going to do this exchange meet. So, we go over to Japan, and Randy actually came with us, so that was really great. So, we went to Japan and the meets fall through, so we actually did this huge trip. It was not very well received when we got home, but there was nothing we could do about it. The meets, the communication, something happened and we actually didn't get to do the meets that we went over there for. But we did get to go to a couple of different gyms over there and practice with the teams over there. One was at a university and one was another club gym. And it was fascinating how different they were. One thing that they did that I think we need to institute in the United States, maybe some gyms do, but after practice everyone got buckets and rags and washed the gym. Everyone on the team washed the whole gym after every practice. That was the way they did it in Japan, and that was really wonderful, because the gyms were spotless. Not all the chalk and everything that we had. But everyone, all the coaches, all the athletes, everyone just washed the gym after we practiced. The Japanese were wonderful, really hospitable, it was really fun to get to work with their teams, and they coached us a little bit and that was really fun. And that was actually where I learned to use chopsticks. I can use chopsticks to this day. Because we—there were no forks. We had to use chopsticks. But it was great. JD: And so you were just eating traditional food that the Japanese athletes—and what was your reaction to that? There's not a whole lot of—well there wasn't a whole lot of Japanese food, cuisine in the US at that time. ML: Yeah, it was not as much. I think we've gotten a lot better about having all of those different international foods here now, so easily accessible. I really liked it. I thought it was great. There were a few little raw fish things that I didn't care for. I still don't care for them, but for the most part I really liked it. It was good. JD: so, you were clearly very successful, you know, I could list all of your, you know, your awards, but you were All American, which was again, attests to your academic prowess as well as your abilities as a gymnast. You know, won many events and were—won the NCAA one year, at least. JD: Do you have any kind of final thoughts about your college career and your experiences? ML: well, I would just again say Oregon State is a really special place, and the people there really believe in the students. And I have been fortunate to continue my teaching career at Oregon State, so when I stayed home with my son David, then my good friend Laura Worden, who was the swimming coach for a while at Oregon State, and then when her son Daniel was born, decided she wanted to be home with her son to raise him as well, and then their three boys, so Laura and I started doing this trade thing where she would teach physical activity courses in swimming; she would bring her boys to my home and I would watch them with our kids, and then Laura would go teach her class and then Laura would come back to my house and watch the kids while I went and taught my classes. So I started out teaching dance aerobics and step aerobics, and then they asked me to start teaching the gymnastics classes, so I did start teaching the gymnastics and tumbling classes, kind of developed that program a little bit and the PAC program, and then I've taken up Pilates and have taught some fitness yoga classes, so just all kinds of fun, different things that I've been able to continue being part of the Oregon State family in that way, and I think that it's just a special place. It's just a special place. And Dr. Ray this year, on the University Day, his speech was so inspiring, and he just really communicated this idea that Oregon State is special because of the people that are there and that we have a special heart for students and really want to see students come to Oregon State, pursue their dreams and passions, and their dreams and passions may very well change in the four or five or six years that they're with us. But, that is really what Oregon State is all about, is being a part of students' growth and the students being a part of our growth. I learn from my students every day and it's—I just feel very blessed to be able to be a part of Oregon State as a faculty member, then also with athletics, helping with the meets, coaching at OSU gymnastics camp every summer, it's been really fun to be a part of that, so just in all of these areas, all through the years, I just really feel blessed to be a part of Oregon State. JD: I actually do want to ask you about one other area. We've touched on it some, about women in sports, and Title IX was coming in just right before you were there, and recently, well a few years ago, now, you organized a kind of Title IX anniversary banquet, and I guess I'd like you to talk a little about why you did that, why that was important, to have that focus. ML: Well really I was just a helper in organizing that. Marianne Vydra actually was the spearhead of that. There were a lot of people involved on that committee, but Marianne really did a phenomenal job, and there were like lots of people that helped with that event, but I think the vision for that was just to help create this remembrance and kind of going forward, present and future, all of Oregon State women's athletics, bring back the women that had lived through, even before my time, what it was like to be an athlete at Oregon State, and had some women come back and tell those stories about, you know, like we sold candy bars to help pay for our trip to Japan. I mean, we didn't pay for the trip to Japan doing that, but that kind of thing is like the women athletes today going "are you serious?" People telling stories that they bought their own uniforms, they bought their own balls, they had to practice at night because the fields weren't available because they guys were on there, you know, and I mean things like that that was really so enjoyable to hear, what women sacrificed, because they loved sports. There was no other reason for them to do all of that, but because they loved sports. And I was that way. I loved gymnastics. I just—when that season of my life, those eight years that I really did competitive gymnastics, I was just, I just loved gymnastics. I just wanted to do gymnastics. And that's how the softball players were. They loved to play. They played—the people that did ball sports, they did like three or four ball sports. I did gymnastics. They did like three sports at Oregon State, a lot of these women. They did volleyball, basketball, softball or track or, you know, I mean they were just, they were amazing athletes. And, so part of the reason for that event was to get the women back and to honor them. Several of them were honored as All-Americans that they didn't—they didn't know that they had, that they were All-Americans, that had been lost in the shuffle, so to speak. There were some other special awards given out that evening. And then the current student athletes being there, and just having them hear those stories of what it was like and what it is for them now, I think that connection, hopefully, I think, really was made, that someone worked really hard, sacrificed, but did it for the love of sport. And they're really benefitting and I think they do appreciate it. I think now it's kind of different. They appreciate it because it's competitive to be a college athlete now as a woman. It's very competitive and you have to be really good to be a student athlete at Oregon State. You have to be really good. It's a PAC-12 conference school and in some of the sports; gymnastics, volleyball, softball, women's basketball, they're the best in the nation, our conference. And so to be at a PAC-12 school, you have to be really good. So, I think they appreciate that, they're an Oregon State athlete, because they worked really hard to get there in high school. They worked really hard to get there. And similar to the Paul Valenti memorial service this past weekend where Coach Tinkle had all of the team there, it was wonderful to see that. They heard these stories of Coach Valenti and the history of Oregon State basketball and what they have now is because of people like Coach Valenti on their side, men's basketball program, and other things of Oregon State athletics. People like Dr. Sylvia Moore, people like Coach Paul Valenti, people like that that poured into Oregon State. And it's great for us to have events like that, events like the Title IX celebration. For the past and the present to come together and really appreciate each other and what we've accomplished for Oregon State and for ourselves and our families. So, that event was really fun. That's kind of what it was about. JD: Well, I want to give you a chance if there's anything that you've been thinking that you want to make sure you tell about, I don't have any other questions for you but I want to give you a chance so that we make sure we capture it all. ML: Oh, I don't think so. I mean we've talked about a lot. JD: We have. You have. JD: Well, it's been a pleasure to hear your stories and thanks so much for participating in the project. ML: You're welcome Jan, thanks for having me, it was good.